Hi, this is another post that doesn’t seem to have a perfect forum fit so I was hoping it would get some responses here. 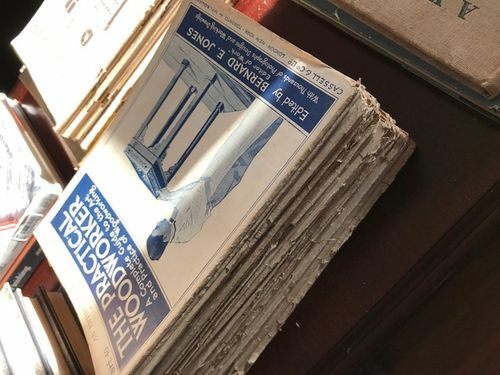 I recently purchased some nice old Globe-Wernicke barrister bookcases for sale locally on CL, and when I was there I noticed a collection of tools and WW books, magazines, etc. Long story short, through the generosity of the owner (it was his father’s stuff) I was fortunate enough to get what seem too be (?) 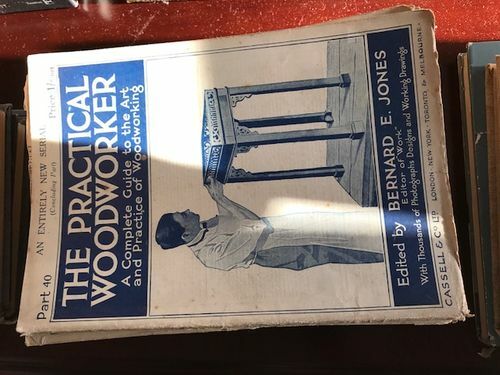 the original serials of the Practical Woodworker that were edited by Bernard Jones (I read somewhere these were circa 1915?). See the images. Some are in better or worse condition, and maybe 5-8 volumes are missing, but I was shocked to see these and knew immediately what they were because I have the green 4-volume set already. Anyone know anything about these or if they are the originals or what the value might be? I’m not selling, I’m thrilled to have and hold on to them, but was just curious. Also figured some of you may get a kick out of seeing these, I’ve never seen them and can’t find any on ebay. Every now and then a squirrel gets a nut I guess. Thanks. That is really cool. Would be great if they could be scanned and preserved on one of the online archives. I’ve looked through some 19th century woodworking periodicals, the projects were very advanced compared to today’s magazines. The arguments that went back and forth through reader mail were no different than what happens today, kinda funny really. Thanks for the comment Rick. He also had some editions of The Woodworker from 1925/26 and I agree, the projects were not all that simple. Not sure about scanning, some are in such bad shape I hesitate to handle them too much. Of course, the 4 volume set is available but these originals are kind of nice. I wouldn’t mind having the 4 volume set but shipping doubles the cost. I hear ya, but still fairly cheap overall for a nice set.